Well done to Nick and Adela, this month's winners. The Committee made an 'Outstanding Achievement' award to Mike Baldwin for completing his 21st 3 Peaks race. Report from Dave Westhead ... the Bradford 10k is a reasonably flat, out-and-back route, from the Town Hall out along Canal Rd towards Shipley. It has just enough short sharp hills and bendy sections at the start and in the middle to mean it's not quite a PB course. Sunday was bright and sunny with the odd sharp shower and a brisk wind that lifted race HQ off the ground and almost blew it away just after I finished. As for the other Dave W below in Lincolnshire, the breeze did make fast times quite difficult with a few sections of Canal Road straight into a head wind. Two people did manage to impress - the winner, because the time below is a new course record, and Dave Green because his PB below was his first sub 50. Well done to them both - I'm sure there is more to come on faster courses and in better conditions. From Nick Pearce ... I rather surprised myself with a time of 3h07:41, 294th from 4956 finishers and 2nd V60 in the Manchester Marathon yesterday, my first road marathon for at least 15 years. Conditions were ideal with a cool breeze, a flat course (billed as the flattest in the UK with only 55 m of ascent), and a good atmosphere and support all the way round, with regular refreshment points. 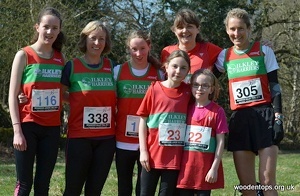 Didn't see any other Ilkley Harriers - the other red and green vests turned out to be a Welsh club. Legs rather stiff this morning... results. Well done Nick, this breaks Geoff Howard's 2005 Club record of 4h10:34 in New York! From Andrew Mitchell ... the race was postponed from 24 March 2013 due to the snow. A breezy day plus a killer hill at 8K didn't make conditions easy. From Dave Wilby ... I headed down to Scunthorpe to make my half marathon debut on Sunday. The event was really well organised with closed roads, chip timing and apart from 2 bumps to cross the motorway was probably about as flat as it gets. Being fairly rural it did mean that was little shelter from a wind which was persistent but not overly strong. I got into a group early on which was going at roughly my target pace but towards 9 miles or so I slipped off the back and never recovered. I eventually finished 14th in 1:18:58, bitterly disappointed with my time, particularly as I'd hated almost every step and was hoping not to have to do another one. I'll have to do one now to try and rectify the time but only once my legs recover, they've felt far better in the past after thrashing them up and down the long lakeland fell races!! I should say that the oraniser had done a great job, and you roadies should check it out. I even got a free post-race massage!! From Alex Hall ... I competed in the Sunderland City 10K yesterday as a method of training for the regatta season for my rowing squad at Durham University. I started at the back of a 1580 person pack due to arriving late to the start line but managed to finish 78th with a time of 43:15 on a fairly flat course (many thanks to the speed sessions on thursday nights). Ben Sheppard adds ... Where was my responsible adult when I sneaked online and entered this excruciating race? The field was stacked with fell running talent of the highest order, and that's just the Harriers. Joe Symonds proved his class with a second consecutive win, (taking him closer to his father (Hugh)'s record of three titles (1984, 1985 and 1987)), and just two weeks after a 2:20 road marathon. Meanwhile Harriers also performed out of their skins too, spurred on by the tremendous support all round the course. Fell running star of the future Will Buckton delivered on some of his great promise, taking an incredible 45 minutes off his 2012 time to comfortably beat 4hrs, while in other news Mike Baldwin completed his 21st (twenty first!!) consecutive 3 Peaks race and took the prize for biggest pathological glutton for punishment. It doesn't feel like it right now, but a great day was had by all. Some photos from the Woodentops. More on 3 Peaks from Alison .... What great results from the Harriers. I found it hard from start to finish but looking at Graham's photos of the race many of you make it look like a walk in the park! Will must be delighted with his massive PB and Adela was over the moon on the finishing line to clock under 5 hours despite chipping her tooth on the way off Whernside. We must have been the best represented club on the ladies side with 9 ladies finishing and Jann, Rebecca and Kate winning third ladies prize. 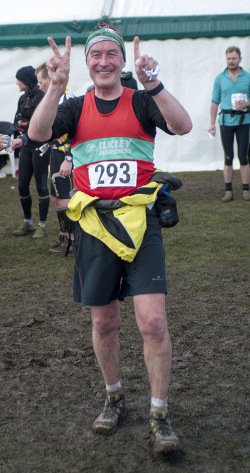 Mike was a absolute star finishing his 21st Three Peaks race with a big grin on his face! Well done to everyone. Some super results from the 7 juniors who made the 300 mile round trip to Shropshire this weekend to compete in round 2 of the Junior English Champ Championship Fell race hosted for the first time by Mercia Fell Runners. Full report from George Elmes on the junior pages. From Brian Melia ... Just returned back to Tokyo to recover from the Mount Fuji Ultra-Trail with my good friend Chiharu Watanabe. We both had fabulous races in one of the most beautiful places I have ever been to. The race is 100 miles over a very technical course and very exciting. Woohoo, the BOFRA season is underway! Report from Sally Malir ... After 30 seconds of silence to remember the victims of the awful events less than a week previously in Boston the marathon community in London set off wearing their black ribbons to show their support.The weather was perfect and the crowd was the best ever! I really enjoyed my run relaxing into a steady pace, which I nearly managed to keep perfectly even all through the race. This really motivated me as I passed more and more people as the miles went on. The sights were amazing, and often brought goosebumps to my skin although I was boiling hot. At around 25 miles a guy stumbled and fell in front of me, a fellow runner picked him up and steadied him making sure he was alright before finishing his own marathon, this summed up the support everybody showed for each other. I saw many familiar faces and heard many friendly shouts, it's amazing among all those thousands how you can pick out your supporters. In the end I was 137th Women, 9th in my age group, and happy. I don't think it will be my last marathon. Sally has beaten her own LV45 Club Record of 3:10:40 set at Manchester in 2012, and Hilda Coulsey beat Chris Porritt's LV60 record of 4:16:00 from Leeds 2002. Jez Hellewell reports ... a beautiful day for the inaugural running of the Over The Odda race which brought out a couple of the local "big guns". Tom Adams winning by some margin at the finish (Quentin Lewis 3rd), followed by a jog back home over the moors for a cool down. Quite a few Harriers vests on show I'm glad to report. Nice to meet Petra Bijsterveld at the start & Adela Reperecki, despite start line reservations, had a great run to pick a Lady Vets prize (I say "pick up", but unfortunately she'd already left!). A good few minutes behind Tom came myself (6th), Ben (top 10, we think) & Justin (just outside the top 10). "Winner gets the beers in" was the shout beforehand. I'm therefore very suspicious as to why Ben & Justin were just behind me at the finish. 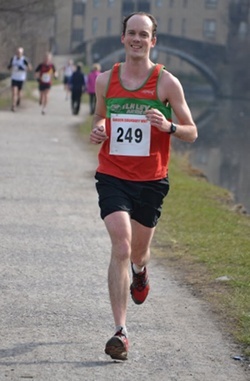 Always a favourite with Harriers, provisional senior results from Valley Striders site. Lots of photos on woodentops.org.uk. Great to see lots of juniors out too with some fab results! Report from Alistair Barlow ... a magnificent day in the Lakes doing the Anniversary Waltz (AM 11.5 miles, 3600ft) in the beautiful Newlands valley. From the start there's a long run on tracks and road up the valley before the action really starts will a long and steep climb up to the summit of Robinson. From there it's good running terrain over the fells at the head of the dale before swinging north towards Catbells and home. The descent looked good fun when viewed at the start but was pretty painful after 11 miles and I hobbled home in about 2:20. All quickly forgotten with the help of free soup and beer in the village hall. All in all a great day out and thoroughly recommended. Steve Turland (and Helene, Ed) had done the longer and much tougher Teenager with Altitude ...next year ... maybe! Our three club members at Boston are safe, as reported on Facebook, and Andrew M has emailed. From Ben Sheppard ... A short journey from the sunshine of Ilkley to the sideways rain of Wycoller Country Park nr Colne for a low key and enjoyable BM race over 8.2m with 425m / 1394ft climb. Desperately trying to keep in touch with Will as he ploughed strongly up the seemingly never ending climb to the top of Boulsworth Hill (also known as Law Lad I believe) and managing to catch him by the top only to be left trailing in the wake of his fast and fearless descent. The late Bill Smith came to mind as I went thigh deep in a bog, before hauling myself out for a long run in punctuated by deeper-than-expected puddles strategically placed to make the fair-weather trail runners among us look like John Inman (see photo). 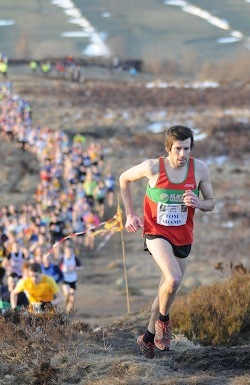 A local race that should be popular with Ilkley Harriers if repeated in future years. From Eddie Winslow ... I made another trip over to Driffield for the Woldsman 50. I couldn�t repeat my win of last year but came home 6th in 9h42m, 8 minutes slower than a year ago. From Henry Heavisides ... Three of us travelled to Spenborough track as an alternative to the regular Wednesday Carnegie track session. Best performance came from Mark Iley in the 1500m running 4:54.3 for 4th place. Beth Massey ran 5:47 (I think) in the same race. The 800m was split into two races I was first to finish in the over 50s race in 2:36.5. The 3000m followed soon after the 800m, so I struggled to finish 10th out of 17 runners in 11:21.1, Beth was 11th in 11:29.4. Big improvements by Bradley, Rob, Diane, Lucy, and Adela on last week's Bunny Run times! Results and photos on woodentops.org.uk. 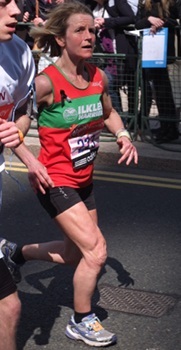 Well done to Linda Wilson, who was 461st in 4h28:37. Results on ukresults.net. From Eddie Winslow ... I got round in 3h51m, a few minutes down on my previous attempt but the residual snow and muddy melt slowed things a bit. Mike Baldwin was not far behind and Amanda Parnaby was there as well. Results should be on Nidderdale LDWA's pages sometime. Report from Alison Weston ... Another brilliant day for running. Whilst up with my parents I found a great 6.2 mile race near Roseberry Topping. A mixture of very runnable forest trail paths and fell. 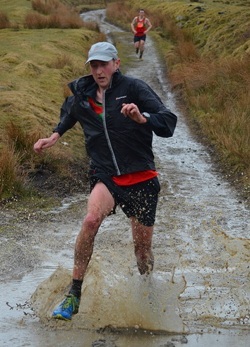 Lots of runners from Thirsk and Ripon ran this race as one of a whole winter series of races in the N.Yorkshire moors. My time ~ 53mins. From Will Buckton ... Steve Turland and I competed in the Coledale Horseshoe (AM 12.25km/1036m) on Saturday at Braithwaite in the Lake District. Conditions were excellent with minimal snow and ice on the summits, with great views of the Horseshoe and Skiddaw on the way back. Although the route was shortened from 13.7km due to snow on Eel Crag there was over 100m extra ascent to make up for it! From Mark Hall... Having spent most of the past 6 weeks in Majorca working I had been looking for a race to do and the above race was taking place down the road from my base. The race was the Baleric islands championships so attracted a good field of 600 runners. The course was flat with the last 5km undulating. The weather was good and around 20 degrees. Having only been ticking over with training I would have been happy with a steady 6 minute mile pace. However, when the gun went so did I! I managed to get in a small group with Vanessa Veiga, who ran for Spain at the London Olympics at the marathon. We past 5km in 16.55 10kms 34.31 and both suffered in the final 5kms and lost time, she eventually beat me by 5 seconds mainly due to my loss of concentration in the final run in when I lost a few metres on a twisty last kilometre. I finished 8th, 1st vet 50 (by 5 minutes) in a time of 1.15.36. I was for once pleased with the result especially after my poor preparation. Winner was (I think) former spanish international Rey in 70 minutes. Tom Adams again pulled off the double-yolker of winning the sprint egg stage and the race. Some good runs by other Harriers too, with the juniors mixing it with the seniors, on a lovely evening - dry, sunny, and just enough snow to make it pretty! Results and photos on woodentops.org.uk. There's another Bunny next week, come and join in the fun!